NordicTrack ASR 700 elliptical offers all of the features you’re looking for in a top-quality elliptical fitness machine for a price that can’t be beat. It’s an innovatively engineered fitness solution that will capably help you get into shape fast. 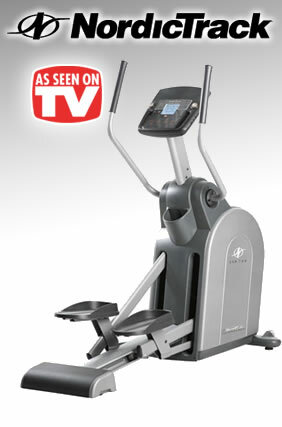 The ASR 700 is an exciting elliptical that features Game & Train Interactive Video Games and iFit Workout Card technology. The Game & Train interactive video games keep you entertained throughout your workout, and because they get easier to play based on how hard you exercise, they also help you stay motivated. If you want quick results, the ASR 700 also lets you plug in your choice of goal-oriented ifit workout cards that are designed to help you get results in only 8 weeks. Like a Personal Trainer, they give you instruction and offer encouragement throughout your workout. To keep you jamming along, it also features an iPod compatible music port that lets you play your own music through the built-in speaker system. If you’ve got to exercise, who says you can’t have fun doing it? Workout Programs: Vary your routine for great results with 14 different workouts that help you burn calories, lose weight and improve your health. Heart Rate Monitor: Get an accurate pulse reading with the convenient sensors built into the handlebars-simply grip them for a quick reading of your heart rate. iFit Workout Card Technology: Lose weight, feel great and improve performance in just 8-weeks with iFit interactive workout card technology! Each card is designed by a Certified Personal Trainer and plugs directly into the elliptical’s console, automatically adjusting your speed and incline, while the voice of a personal trainer takes you through each workout. iFit workout cards are available in Wellness and Weight Loss categories to give you the most advanced, interactive and result-specific fitness options. Display: Change your perspective with Grafixx; the console display advanced enough to animate an electronic figure to work out along with you. Game & Train Interactive Video Games: Add excitement to your workout with Calorie Destroyer and Fat Blocker video games. The harder you work, the easier the game becomes. iPod Compatible Music Port: Connect your iPod (and most MP3 players) to this iPod compatible music port and listen to your own music through the built-in speaker as you exercise. Digital Resistance: Digital resistance allows you to adjust your workout resistance for increased calorie burn and higher intensity. It also works together with the Personal Trainer workouts to automatically control your resistance for great results. The NordicTrack ASR 700 elliptical is a top-quality exercise solution that’s designed to ensure that you get a superior workout every time that you use it. The NordicTrack ASR 700 elliptical from NordicTrack will get you started toward meeting your fitness goals and burning off those extra pounds in no time.